If the sudden assassination of Indira Gandhi in 1984 proved to be a great shock for both India and the rest of the world, the assassination of her son 7 years later proved to be equally shocking. Rajiv Gandhi’s assassination came amidst rocky times for the nation of India, during an era when the country was just recovering from the aftermath of Indira’s assassination and was itself mired in much political instability, both internally and externally. Rajiv Ratna Gandhi (Hindi: राजीव रत्न गांधी) (1944 – 1991) was the sixth Prime Minister of India, serving from 1984 to 1989. Eldest son of the third Prime Minister of India, Indira Gandhi (Hindi: इन्दिरा गाँधी) (1917 – 1984), and grandson of India’s first Prime Minister, Jawaharlal Nehru (Hindi: जवाहरलाल नेहरु) (1889 – 1964), Rajiv was never interested in politics until the sudden death of his younger brother, Sanjay Gandhi (Hindi: संजय गांधी) (1946 – 1980), who died in a plane crash in 1980. Sanjay was Indira’s preferred choice as her successor, but his death meant that Rajiv had to be persuaded to take over his brother’s role in India’s political arena. He thus left his dream career of being a pilot for Indian Airlines at the behest of his mother. He won his brother’s parliamentary constituency the following year and was groomed by his mother to take over the leadership of the Indian National Congress. 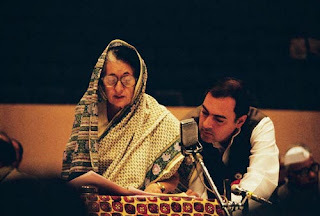 Right after his mother’s assassination on 31 October 1984, Rajiv was urged to succeed her as Prime Minister. He was sworn in within hours after her death, consequently being forced to lead a country that was in chaos as public anger against Sikhs mounted in the aftermath of Indira’s death. Soon after succeeding premiership, Rajiv called for the dissolution of parliament, paving the way for a general election at the end of that year. Rajiv’s Indian National Congress won a landslide victory with the largest majority in Indian history, giving him strong control over the government. This statement reportedly did not go down well with the Sikh community in general, who felt the authorities were siding the anti-Sikh rioters and were deliberately taking slow and lenient action against the rioters so as to allow a degree of victimization against the Sikhs. 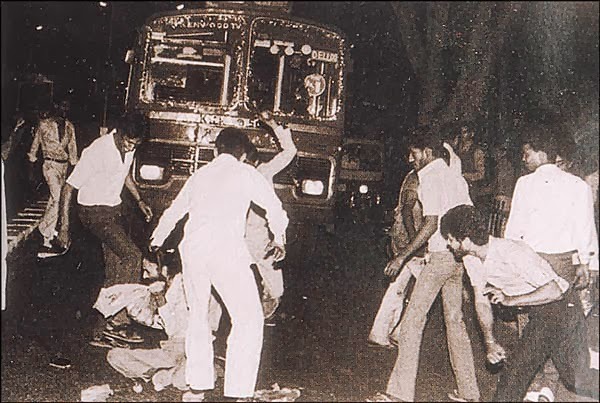 It was thus no wonder that Sikh militants were among the prime suspects behind Rajiv’s assassination in 1991. After all, there had been an attempt on his life by a Sikh assassin in 1986. Nonetheless, the perpetrators came not from the north (i.e. the state of Punjab (Punjabi: ਪੰਜਾਬ)), but rather from the south (i.e. the country of Sri Lanka (Sinhala: රී ලංකාව)). Before going into the details leading up to Rajiv’s death, it is worth having an overview of Sri Lanka’s demographic composition and the background of the country’s civil war. The Sinhalese form the island-nation’s largest ethnic group, comprising approximately three quarters of the population. Tamils form the second largest ethnic group, comprising about 10% of the population and are mainly concentrated in the northern and eastern parts of the island. Since Sri Lanka’s independence from the British in 1948, numerous legislations and policies were passed by the Sinhalese-dominated government that were seen as discriminatory towards the island’s Tamil minority. As a result, anger within the Sri Lankan Tamil community brewed over the decades, finally triggering a civil war in 1983. The civil war, waged by several Tamil militant groups against the Sri Lankan government, sought to establish an independent state of Tamil Eelam (Tamil: தமிழீழம்), covering the Tamil-majority areas in Sri Lanka. 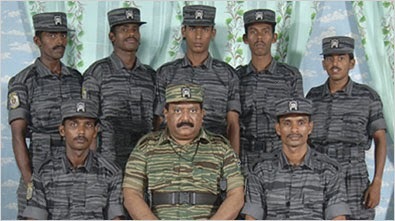 Among these militant groups, the Liberation Tigers of Tamil Eelam (LTTE) (Tamil: தமிழீழ விடுதலைப் புலிகள், Tamilila Vitutalaip Pulikal), or Tamil Tigers in short, stood out the most, with its leader Velupillai Prabhakaran (Tamil: வேலுப்பிள்ளை பிரபாகரன்) (1954 – 2009) being a firm believer and a fierce fighter for the Tamil Eelam cause. In the years prior to the start of the civil war, LTTE and other Tamil militant groups in Sri Lanka formed strong ties with various political parties in the Indian state of Tamil Nadu (Tamil: தமிழ்நாடு), where Tamils form the majority. These political parties threw their full support behind the Tamil Eelam cause and even offered the state as a sanctuary for the militants, in addition to supplying them with arms, ammunition and training. Not wanting to antagonize the overwhelming support in Tamil Nadu, the Indian government under Indira and subsequently Rajiv initially chose to sympathize with the Tamil Eelam movement. 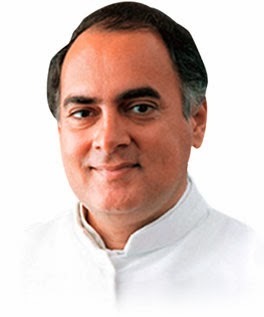 When Rajiv succeeded the premiership, he wanted to establish friendly relations with India’s neighbours, but at the same time wished to avoid antagonizing Tamil sentiments in Tamil Nadu. As the civil war raged, the Sri Lankan government rearmed itself and by June 1987, it succeeded in laying siege on the city of Jaffna (Tamil: யாழ்ப்பாணம், Yālppānnam), LTTE’s centre of operations. 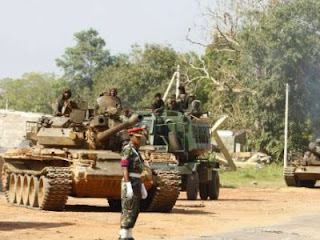 The siege resulted in large civilian casualties, which quickly escalated into what was seen as a humanitarian crisis especially in the eyes of the Tamils in Tamil Nadu. Fearing a Tamil backlash, the Indian government called on the Sri Lankan government to stop the attacks and negotiate a peaceful settlement, but to no avail. The Indian government had to be seen to be doing something in favour of Tamil sentiments back home. A convoy of unarmed Indian ships carrying humanitarian assistance was sent to northern Sri Lanka but this was intercepted by the Sri Lankan navy and was asked to turn back. After the failure of this mission, the Indian Air Force flew over Jaffna to airdrop supplies to civilians, in a show of force by the Indian authorities. Strict warnings were given by the Indian Foreign Minister to the Sri Lankan High Commissioner in New Delhi that if the operation was in any way hindered, India would not hesitate to launch a full military retaliation against the island-nation. Such display of military force by the Indian government alerted the Sri Lankan President, Junius Richard Jayewardene (Sinhala: ජුනියස් රිචඩ් ජයවර්ධන) (1906 – 1996) to the possibility of active Indian military intervention in Sri Lanka’s internal affairs. He thus offered to hold talks with the Indian government, at the same time lifted the siege of Jaffna. 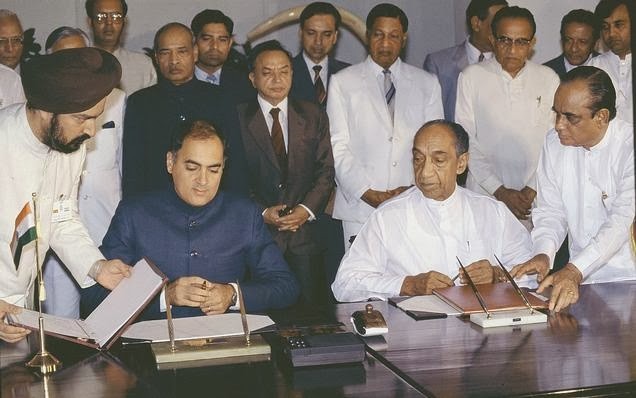 The talks resulted in the signing of the Indo-Sri Lanka Accord between Prime Minister Rajiv Gandhi and President Jayewardene on 29 July 1987. Terms in the accord included the withdrawal of Sri Lankan troops, the disarming of the Tamil insurgents and concessions to several Sri Lankan Tamil demands, such as devolution of centralized power to the Tamil-majority provinces, merger of the Tamil-dominated northern and eastern provinces subject to later referendum, and official status for the Tamil language. Notably, however, the LTTE and other Tamil militant groups were not made to be part of these talks. 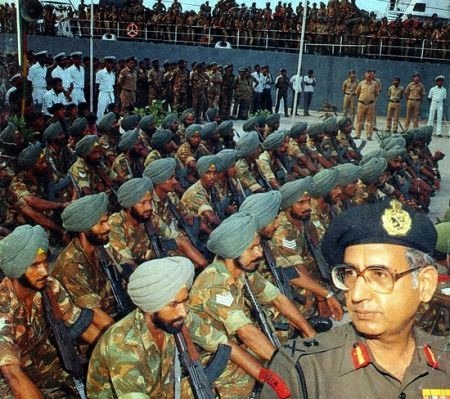 As per the conditions laid out in the Indo-Sri Lanka Accord, the Indian Peace Keeping Force (IPKF) (Hindi: भारतीय शान्ति सेना, Bhāratīya Sānti Sēnā) was formed under the Indian military and was sent to Sri Lanka to end the civil war. Initially, the IPKF was not expected to engage in any major combat, as the LTTE and other Tamil militant groups had agreed to disarm peacefully, albeit reluctantly. Nevertheless, after the formation of an Interim Administrative Council under the IPKF, differences came in between the IPKF and the LTTE, in which the latter did not only attempt to dominate the council, but also refused to disarm. These differences culminated in a combative attack against the IPKF, after which it was decided that they would disarm the LTTE, by force if necessary. A series of combats between the two ensued. The presence of the IPKF in Sri Lanka soon became unpopular, as the Indian force was also accused of its fair share of human rights violation on Sri Lankan ground. When President Jayewardene retired from active politics at the start of the new year in 1989 and Ranasinghe Premadasa (Sinhala: රණසිංහ ප්‍රේමදාස) (1924 – 1993) succeeded him, the latter called for the withdrawal of the IPKF, but was met with refusals from Rajiv’s government. Nonetheless, the IPKF mission itself, coupled with other issues pertaining to corruption scandals and increasing Sikh unrest in Punjab, resulted in the ousting of Rajiv’s Indian National Congress from government in the 1989 general elections held in November. Vishwanath Pratap Singh (Hindi: विश्वनाथ प्रताप सिंह) (1931 – 2008), who succeeded Rajiv as Prime Minister, ordered the gradual withdrawal of the IPKF, and its last troops were completely withdrawn from Sri Lanka by March 1990. Barely two years after the 1989 general elections, another general election was called for in May 1991, which saw the possibility of Rajiv returning to power. 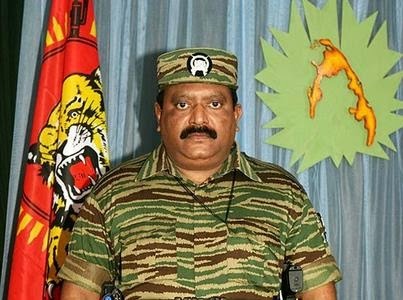 Fearing the possibility that Rajiv might reinitiate the IPKF’s efforts to disarm and destroy the LTTE should he return to power, the latter’s leader, Vellupillai Prabhakaran, decided that a major clandestine mission should be undertaken to eliminate this possibility. What exactly was this major clandestine mission that Prabhakaran had devised? And was it successful? Proceed to the next part of this article if you’d like to find out.